Happy day, everyone! Aren't you glad it is Friday?! I definitely am ready to have a fun weekend! We will be celebrating our friend Grant's birthday this weekend...so it should be a fun one!! Well, if you are a PTI fan...you know what today is!! Instructions: Fold kraft cardstock in half to make card base, and round the lower left and upper right corners. Cut a blue damask paper slightly smaller than the card front, and then cut in half longways. Round the lower left corner, and then adhere the paper block to the front. Diecut and emboss the label from vintage cream cardstock and punch a hole through the top. Thread cream ribbon through the punched hole, and and then adhere the entire piece to the front. Tie a button around a bow with twine, then adhere the bow to the top of the label. Punch a scalloped edge to different strips of blue and pink patterned papers. Adhere them to a 2"x4" cardstock scrap in alternating colors, and then cut the butterfly from it at 2" using the Cricut Expression and Stamping cartridge. Accent the middle of the butterfly with pearls, and then adhere it to the top of the label on the card. Stamp the sentiment in the lower left corner to finish! That butterfly is gorgeous! Love those tiny scallops! Your card is beautiful! LEA!! You're SO CLEVER!! I love your card, the butterfly is beautiful!! This is so elegant and pretty! Love it!! love your butterfly! 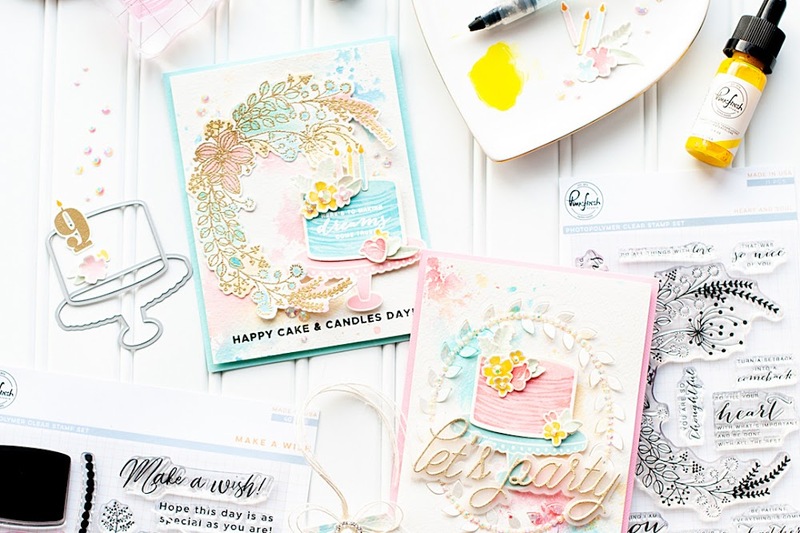 oh, and, congratulations on all of your gorgeous cards in the colour inspiration magazine...you rocked that one, girl. very pretty! i'll have to give that a try, soon. This is gorgeous, LOVE your scalloped butterfly!! Beautiful card. Loved all the pastel colors that you have used. I am so loving the scallop butterfly and want to give it a try. Very pretty. How beautiful! I LOVE that scalloped butterfly, and the colors and those yummy pearls! Lovely. Love all the detail and your ribbon treatment. Very pretty! Omg I love this and such a clever way to use scallops your work is amazing!!!! Love the butterfly! and the colors! Lea amazing butterfly and cute colors. What a wonderful concept of the scallops...love that butterfly and your colors are pure "yummy"!! Great job! Love the butterfly. i love how you pieced together different scalloped borders and then die cut the butterfly! Beautiful! I'm tucking this away in my "to try" file - that butterfly is so pretty. what a great idea for the butterfly! so creative and pretty! You are so creative Lea! Your LO's always vary and are so pleasing to the eye. I love the scallop butterfly! Just adorable! LOVE your scalloped butterfly, so pretty! Very pretty card. I love the scallop butterfly. Think I just might have to try that one. The scalloped butterfly is so pretty! I love the colors you used! Very pretty card! What a beauty!!! Love the butterfly and the soft colors! Beautiful Card Lea!!! I love the way you layered the scallops on your butterfly and the soft colors look wonderful! Gorgeous card! Great idea to create the butterfly with scallops! Lea, I love your unique take on scallops. The butterfly is beautiful. Great layout too. So beautiful Lea! I just love that butterfly! Awesome card! Your butterfly is gorgeous! I love that you used different patterned papers for a really unique look. So, so pretty! Wow! That is so cool. I love how the butterfly looks! Wowza - this is awesome! The butterfly is sensational--such a great idea! Beautiful card! I love what you did with the butterfly! Lovely card...and those colors are fabulous! This is a beautiful card. I love the scalloped butterfly. beautiful! I love love love this butterfly! adorable concept, so well executed with beautiful colors and I LOVE the pearls! Thanks for the inspiration! The layered scallop butterfly is gorgeous! Love the soft pastel colors and mix of patterns--just perfect! Girl, this is lovely!! The scalloped butterfly is divine - absolute perfection!! Lea, your blog is one of the most gorgeously beautiful places on the web! This is exquisite! I love the delicate way you've incorporated scallops - and your colours are sooooooo pretty! WOW!! gorgeous colour combo, and taht scalloped butterfly is just stunning! Absolutely amazing my friend!!! Love,love, love the butterfly!! Beautiful card Lea! Love the scalloped butterfly! 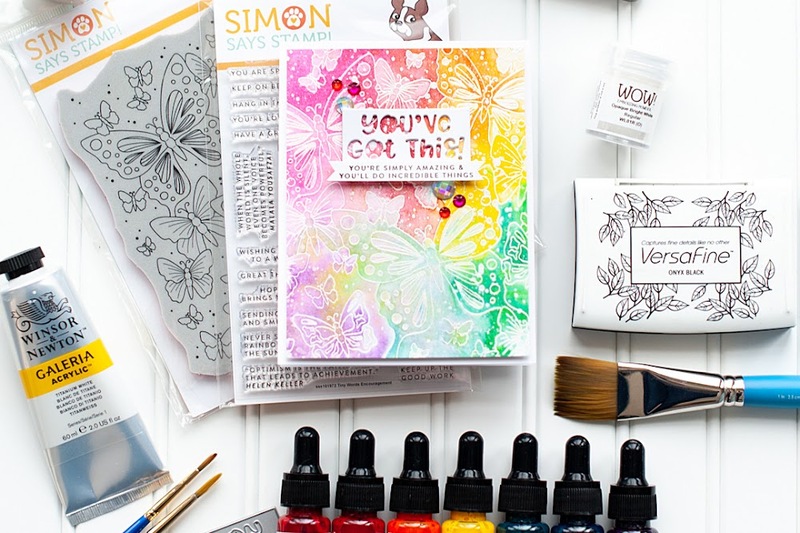 The stamping cartridge has to be one of my favorites... and I *love* your butterfly too!! What a great creation... especially when I first thought you ran it through the die. Now my mind is thinking of all the possibilities of doing that with different cricut cuts!! Beautiful scalloped butterfly. What a great idea! 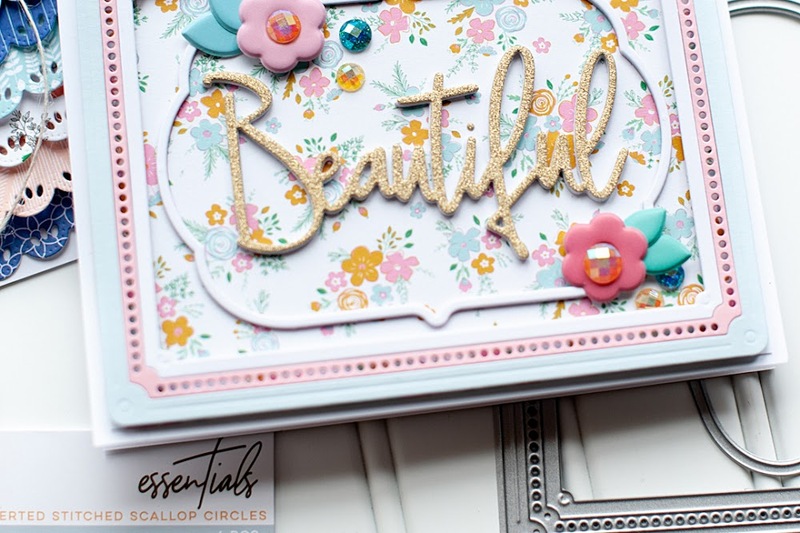 Oh WOW, the scalloped butterfly is FABULOUS, and oh so creative, LOVE this stunning card! Wow-Just love how your scalloped butterfly turned out-great adding the pearls down the middle. Great job! I love what you did with the butterfly. And your soft choice of colors remind me of spring too. Very pretty card! Lea, wonderful card! 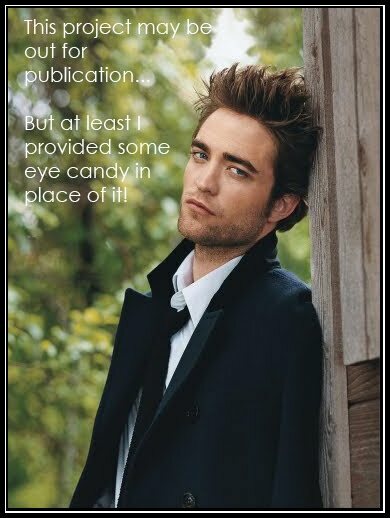 Love your creations, always fun checking out ur blog! Oh Wow Leah!!! I LOVE this...what a super idea to use the scallops to design a butterfly!! Love the layered look. Great job. Um yeah....I tried making a butterfly like that...didn't quite make it like yours...I mean it didn't quite turn out all pretty and soft....LOL This little babe is a beauty...and I love the halfcut patterned paper in the background too...you always have the bestest ideas. What a great layout, so unique! The butterfly is soo beautiful in those colors and lovely scallops! Pretty card! Love how you did the butterfly! What a gorgeous card! I love the butterfly--the scallops are so elegant! Beautiful colors and scalloped butterfly. Lovely card! Oh I love the idea scallop on butterfly! So pretty and creative! Your scallop-y butterfly is brilliant, Lea -- the whole card is perfect. Love how you rounded opposing corners. Wonderful card! What a gorgeous scalloped butterfly, Lea! LOVE it!